IMPORTANT: Some of the information contained in this document may cause a major change in behavior/process. Please make sure to discuss the change with your local IT support staff or the DoIT Help Desk. What do I see in Outlook for Windows when an account is automapped? What are some of the issues related to automapping? What if I do not want an account automapped? Automapping is a feature in Outlook for Windows that automatically loads/subscribes to any account that the configured account within the Outlook profile has full-mailbox permissions to. If you are linked (have full mailbox permissions) to a Service Account and cannot interact with the account using Outlook for Windows (via automapping) or have opened the service account mailbox via Outlook for the Mac, please make sure the service account is visible in the GAL. Automapping is not available in Outlook 2016 for the Mac. To access another account to which you are linked or have 'Full Mailbox' Permissions, you must subscribe to the account via the process outlined in Office 365 (Outlook 2016 for Mac) - Subscribe/Unsubscribe to an account. Someone can either manually grant you owner/full-mailbox permissions or when you are linked to another account you will be granted 'full-mailbox' and 'send-as' permissions. 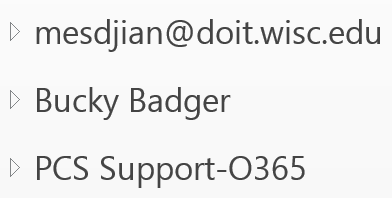 In this example, 'mesdjian' has full-mailbox permissions to "Bucky Badger" and PCS Support-O365 accounts. To view the contents of each of these accounts, expand the folder listing by clicking on the right-arrow next to the account. Send as - when you are linked to an account, in addition to 'full-mailbox' permissions, you also have 'Send as' permissions. When you send an email where the from address is one of the other accounts, the email will be saved in the default configured account "Sent Items" folder instead of the "Sent Items" folder of the account you are sending as. In the example above, the sent mail would be saved within 'mesdjian' "Sent Items" folder. Note: For further details on "Send As" feature, see Office 365 (Outlook on the web | Outlook for Windows/Mac) - Send as or Send on-behalf of another account. Delete mail - when you are linked to an account, you have the ability to delete mail. When you delete an email from one of the linked accounts, the email will be moved to the "Deleted Items" folder of default configured account instead of the "Deleted Items" folder of the account you are deleting the mail from. In the example above, the deleted message would be saved within 'mesdjian' "Deleted Items" folder. Empty folders/calendar - when you are linked to an account and using Outlook for Windows, the folders may be empty (no emails or calendar events). On the "File" tab, click Account Settings in the Account Settings list. In the Account Settings dialog box, click the "E-mail" tab and then double-click your Microsoft Exchange Server account. In the 'Change Account' dialog box, click More Settings. In the 'Microsoft Exchange' dialog box, click the "Advanced" tab. Important: If this fixes this issue, it is recommended that you reset this to its original setting. Client performance - when you are linked to many accounts, Outlook may be sluggish. Permissions - unable to use permissions assigned to the automapped account(s). The steps below can only be performed by a domain administrator. Also, when this action is completed, all people who were previously listed within the automapping list will be removed. Note: There is no programatic way to see which users are within the automapping list of another account. Log into Wisc Account Administration site using your NetID credentials. Select or search for the account you want to manage. Expand the "Office 365" navigational menu. You will be prompted to confirm this action. Click OK. Important: This action will remove every account listed within the automapping listing. You should wait 30 minutes and restart Outlook to see this change. If an account needs to be added back to the automapping listing, either unlink and re-link the account or remove and re-grant full-mailbox permissions. If you have performed the above steps to clear out the automapping listing and still need to work on behalf of a service account within Outlook for Windows, you can configure the service account using Option 3 using its credentials. Ask you domain administrator for the credentials. Important: You may experience issues when you have configured multiple Exchange accounts within the same profile - please review the following doc before proceeding: issue that can occur.